spokesman for the PDP Presidential campaigpn in the 2015 general election, Femi Fani-Kayode over an alleged N1.5 billion fraud. Also included in the charge sheet are former Minister of Finance, Senator Nenadi Usman, a company named Joint Trust Dimensions Limited, one Danjuman Yusuf and another Olubode Oke, who is reportedly on the run. The case is yet to be assigned to a judge and so a date for the hearing has not been fixed. While Fani-Kayode was named in all 17 counts, the former Finance Minister, Nenadi Usman was named in only four of the charges. 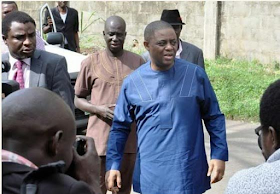 "Usman, Fani-Kayode, Yusuf And Jointrust Dimensions Nigeria Limited on or about January 8, 2015, within the jurisdiction of the Court conspired to indirectly retain the sum of 1.5 Billion Naira, a sum the EFCC said they reasonably ought to have known formed part of the proceeds of an unlawful act of stealing. They, therefore, committed an offence contrary to Section 18 (a) of the Money Laundering (Prohibition) (Amendment) Act, 2012. The Offence is punishable under Section 15(3) & 4 of the same Act,2".